After a couple of summers working in the massed battleship of concrete by the Thames that was Lloyds Bank's computing department, helping install their first office network (a real Betamax of a technology that one - IBM's token ring) and building expert systems to diagnose faults in the data centre, I was really chuffed that they let me borrow a computer for a year. An IBM PC/AT. About as powerful as your dishwasher now. 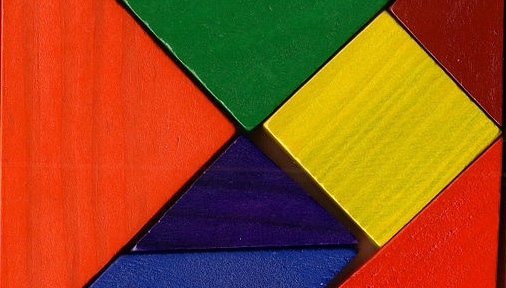 The tangram is an ancient Chinese puzzle comprising 7 pieces that can be put together to form many different shapes - most basically, a square. I was interested in creating a system to model aspects of human problem-solving behaviour with the puzzle. Apart from 20kg or so of PC, I had a hankering to try Prolog, and an interest in blackboard systems from an undergrad AI course. I'm sure blackboard systems are due a renaissance, especially given the rise of distributed systems for coordinating work such as Storm. Bertie was programmed with a number of strategies derived from transcribing people's attempts to solve the puzzle (such as forming convex shapes, or looking for right angles). The resulting shape combinations would be posted to the blackboard where they could trigger further strategies, until eventually an answer was found. Apart from providing early software engineering training, it contributed towards winning the Olivetti prize for the best final-year result, and the interest in blackboard systems suggested a path that a couple of years later led to AI at Stanford.